For many people, the Memorial Day weekend meant BBQ’s, weddings, shopping and travel. Mine was a family intervention. It started out innocently enough. We’d bought a new house and I just wanted to “plant a few flowers out front”. I’ve talked to many other plant-addicts, and this is how it usually starts. 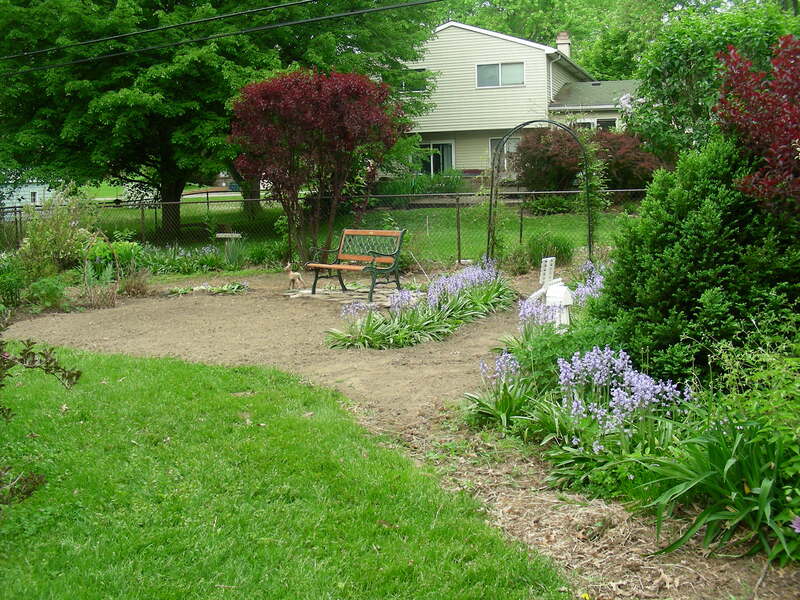 The yard starts to look pretty, adds to the neighborhood property values, and all that physical activity is helping you look pretty good too. Happy. Family and friends are supportive. When it turns from hobby to obsession, you don’t even realize the transition. 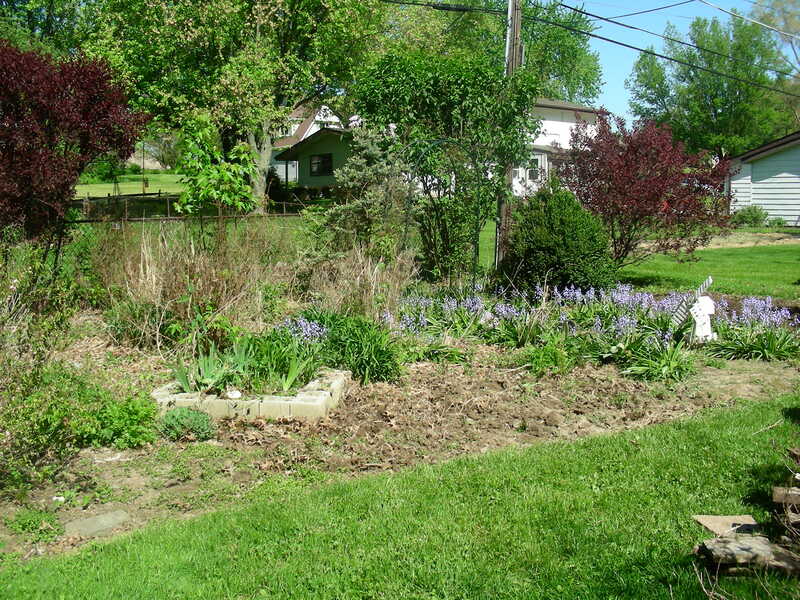 I started adding more and more garden beds, digging myself deeper and deeper into denial. I spent thousands of dollars on “new introductions” and the latest shade of pinks. My beds overflowed with drooping rose colored bells, majestic purple spikes and fluffy white flower heads sparkling in the light. The addiction took more and more of my time, until it dictated my schedule. At my most rampant phase I had 16 beds, ranging in size from tabletop to swimming pool. Every year, my tasks grew almost as fast as the weeds. I’ve clipped and I’ve yanked. Pruned and pulled. Dug and filled. Split and transplanted. If my wheel barrel left those little white dashes they use to mark travel trails on a map, my entire yard would be white. Gardening has many benefits. But like all behaviors taken to extremes, the costs have been many: pulled muscles, injury, wear and tear. I’ve dragged plastic tarps laden with 20 years worth of autumn leaves, to spread over beloved plants, tucking them in for the winter. 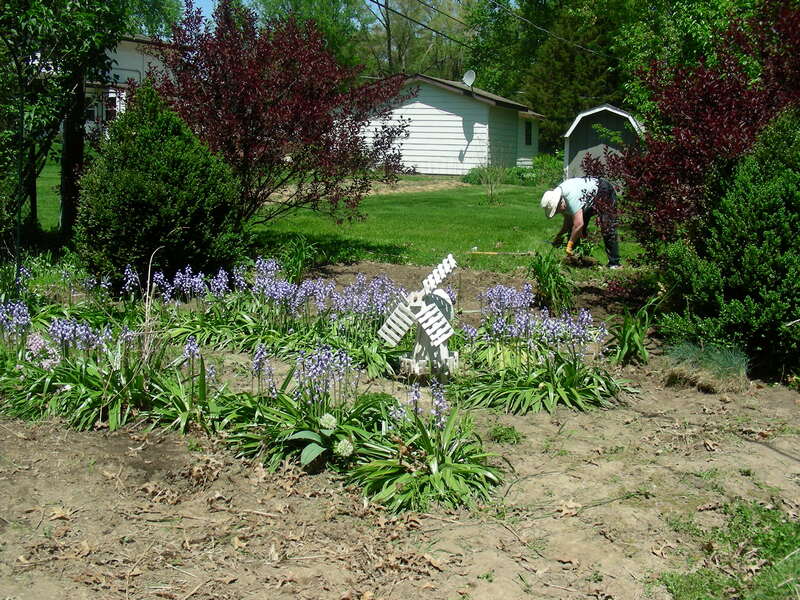 In spring, I’ve refreshed them with sweet-smelling compost, while I smelled of manure and analgesic rubs. My joy in their shiny green splendor has filled megabytes of photos, bookcases filled with garden tips, a shed full of dirt encrusted tools and boxes overflowing with plant tags. If there’s a kitchen utensil missing from our house, you’ll probably find it in the garden supplies. It was too much to maintain. My loss of control was becoming self-evident. I tried to self-regulate. I started downsizing tasks, taking shortcuts here and there. Over the course of a few years I even grassed in that pool sized bed. Still, more has suffered than just my bruised and battered body. My remaining beds have suffered too, resulting in ever greater tasks. A few weeks ago, when I hurt my knee, I bemoaned the situation to my sisters. How it hurts me to see weeds left unpulled while I stand there supported on my crutches! Despite my sorry state, I still yearned to add to my collection of 43 hosta varieties. I’m already dreaming of planting more tulips this October. It was time for a family intervention. My sisters flew into action. They brought their husbands and descended upon my gardens like archangels – slewing the destructive forces that wrought my sorry state. Since this past winter was so harsh, we all lost many more plants than normal, so it was an ideal time to downsize the gardens even more. 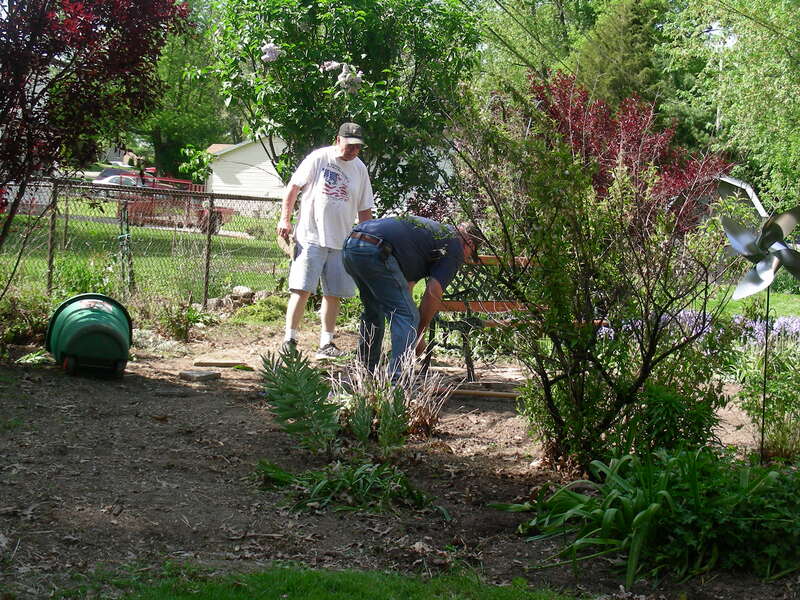 They extracted dead bushes, transplanted bluebells, divided the daylilies, and moved the sedum to another bed. 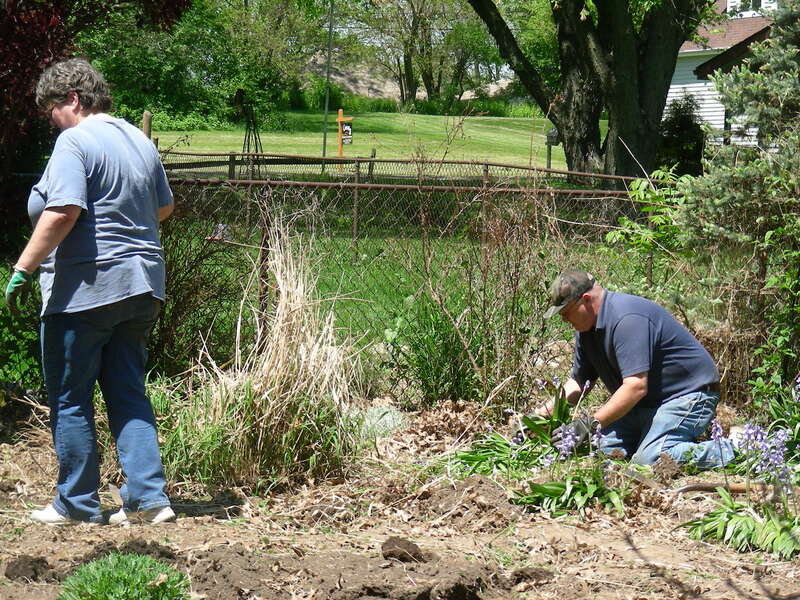 It took the strength of all four of them to extract a large clump of ornamental grass, it’s roots clinging to the ground like concrete – but my family emerged victorious. 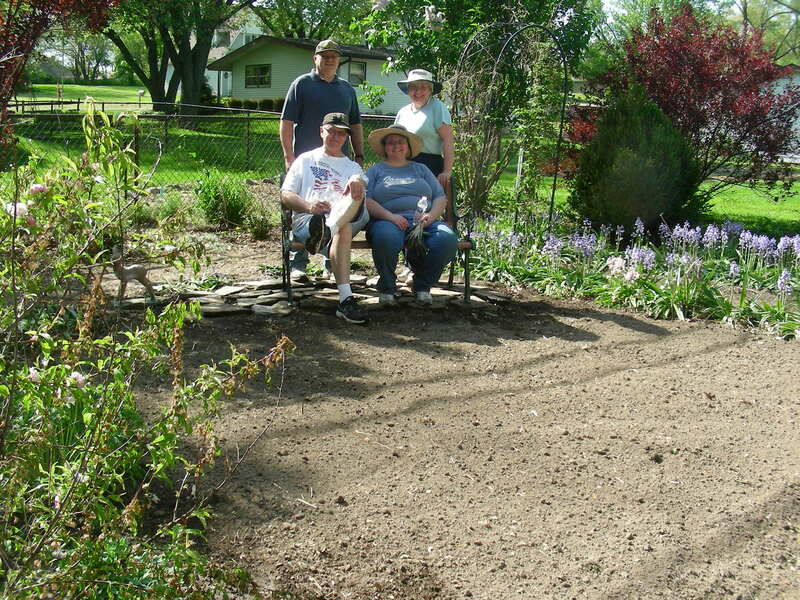 Once the ground was cleared, one brother-in-law used his cultivator to grind the dirt into a smooth powder, perfect for reseeding, while my other brother-in-law did odd fix-it jobs around my house and put together my garden bench. They were tired and dirty. Red-faced from working all day in a full sun area. 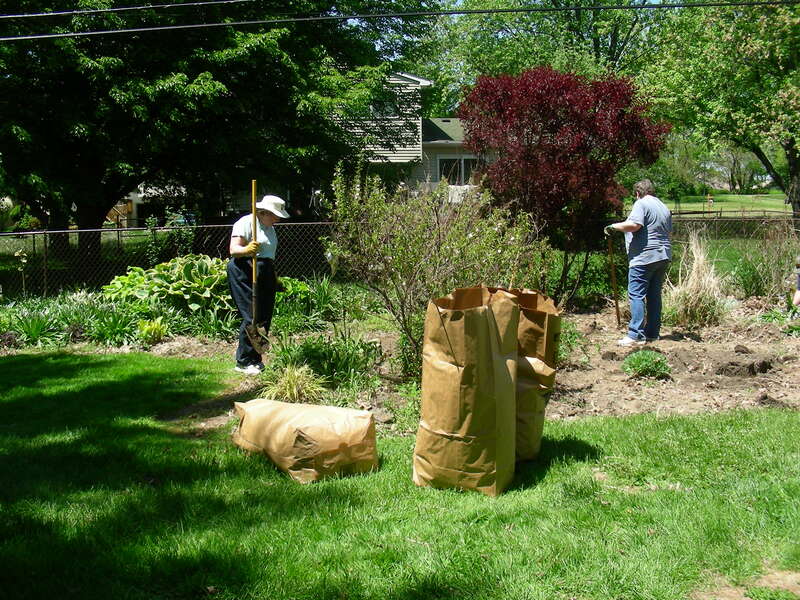 They went through 36 bottles of water and filled 11 bags with yard waste. The material they added to my compost pile measured 6 feet tall. I shuffled back and forth on my crutches, feeling guilty and being able to offer little more than encouragement and water. I fed them breakfast – lunch – dinner. I paid them in popsicles. 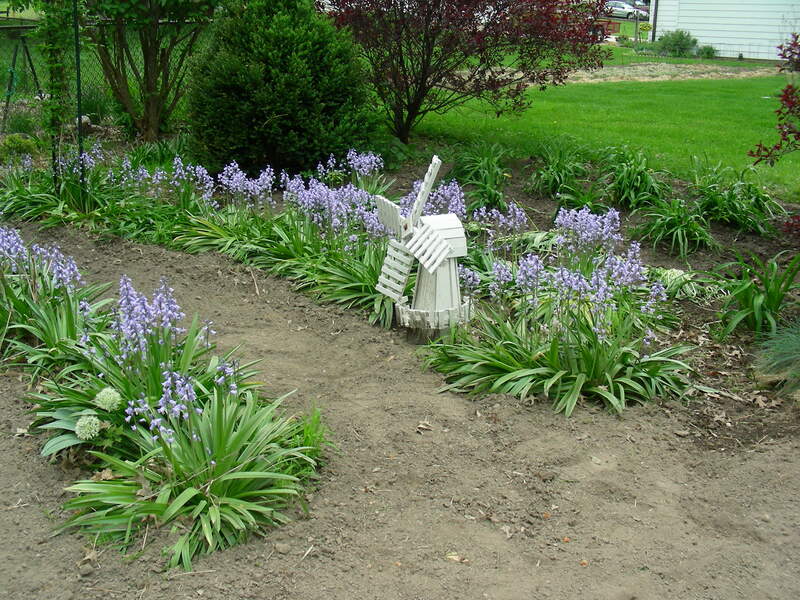 When they were done, they had removed my most challenging garden bed and turned it into a beautiful little alcove, surrounded by a bluebell path, rose bushes, daylilies and clematis vines. What can you say to people that care for you so much? 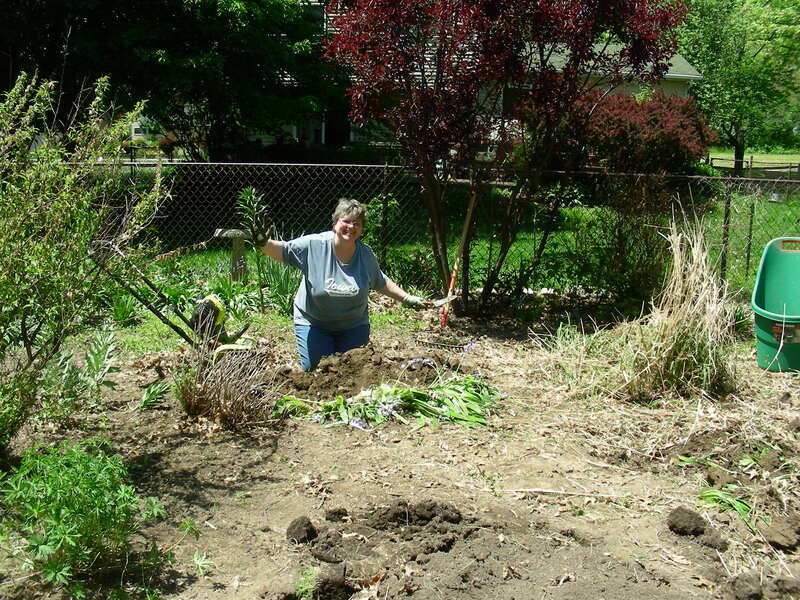 I promised to help them with their gardens this fall, when my knee is healed, but it hardly seems enough. God has indeed richly blessed me, with such wonderful family. Yesterday, Hubby reseeded my newly recovered ground with grass seed. Heavenly, blessed grass – which only needs a simple cut once a week – instead of hours every day fighting back encroaching growth! In my mind’s eye I can already see what it will all look like when the grass grows in and the flowers bloom. My garden bench, sitting serenely in front of the pink and white roses; light purple clematis blooms and the bright, cream colored daylilies to the side. A gorgeous swatch of bright green grass in front of the bench and my little deer lawn ornament. I’ve decided to turn it into something more low-key. 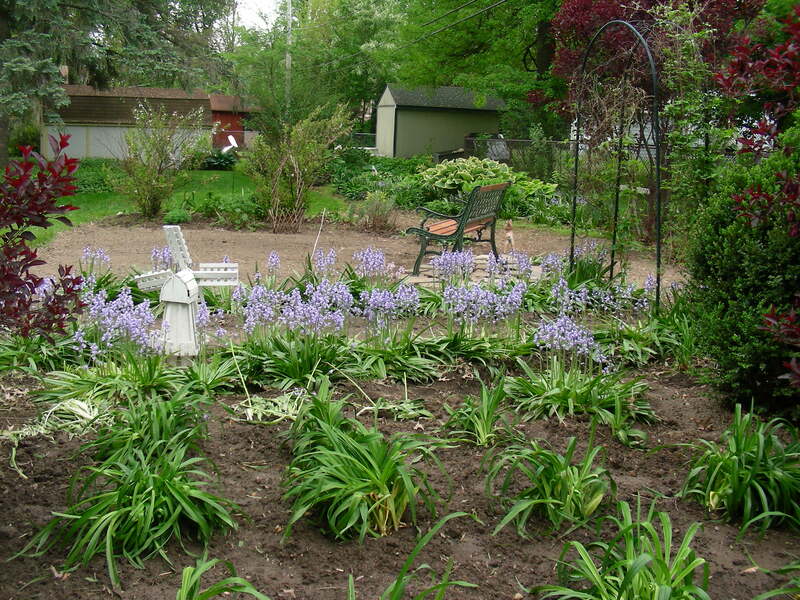 Something that doesn’t require weeding or pruning. A wind chime garden! I can hang them from shepherds hooks throughout the area. Won’t that be grand? Can’t you just hear them now? Once I looked into it I found that wind chimes come in an amazing variety of beautiful designs. I can’t wait! I’ve already bought six. Wonderful story. What did you do to your knee???? In a word… yoga. Some things aren’t meant to bend that way! I was “getting in shape for the gardening season” and re-injured an old injury. Too much, too soon I guess. Duh. Normally every year when we go to get flowers we find something that we both fall in love with and this happens several times. This year we said we are just getting a few flowers and we stuck with it. Every time one of us would say. “Oh look at this” the other would say no we do not need that. Somehow we managed to leave with what we came for and nothing ealse. Amazing!! I loved this story. I always wished I had a sister. You were blessed with two. Love the story! And wow! The garden is so nice! Can’t wait to see pics with that new grass! Beautiful work!!! Somehow I escaped this family without a green thumb, I’m doing my best not to kill what I have in our new house LOL! Can’t wait to see it all in person in a couple of weeks. Yeah, somehow I don’t believe you. I remember your rose garden when you still lived at home. Green is in our blood! There are so many times that when we don’t feel like working or are unable to we wish we had a jeanie. Your family was one. You are so lucky to have them. I need that.